Spacecraft and Launch vehicle. 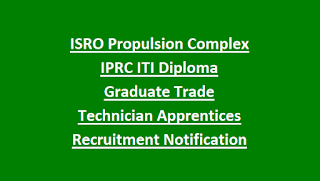 ISRO Propulsion Complex IPRC invites applications from the ITI and Diploma qualified candidates for Trade and Technician Apprentices under Apprentices Act 1961. Applications will be received from 20-09-2018 @ ISRO Propulsion Complex IPRC, Mahendragiri, Tamil Nadu. Application will be accepted in person only. Candidates will be selected for this Apprenticeship Training program on basis of merit in qualifying Exam only. 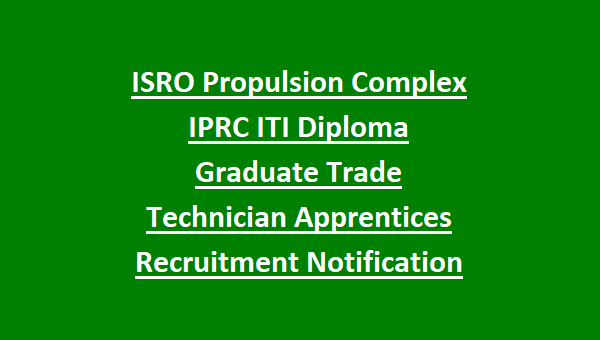 For more details refer details mentioned below for this ISRO IPRC Trade/Technician/Graduate Apprentices Recruitment 2018 Notification. Candidate has to submit the application form in person only. Candidates must have brought the original certificates and copies of certificated for verification purpose. ISRO Propulsion Complex (IPRC), Mahendragiri, Tirunelveli District, Tamil Nadu. There are total 105 ITI Trade Apprentices and 58 Diploma Technician and 41 Graduate Technician vacancies in this ISRO IPRC Trainees Recruitment 2018. Candidates who are qualified Diploma in 2016, 2017 and 2018 they are only eligible to apply for this ISRO IPRC Recruitment. For all the trade's upper age limits is 35 years. Candidates will be selected purely based on merit in their educational qualifications. Download application form from IPRC official website of career.iprc.gov.in. And attach the all required documents and original and copies of certificates and submit the application form directly at IPRC from 13-10-2018 to the above given address in person only. No post or courier or with others will not be accepted. Must have bring the original certificates for verification.